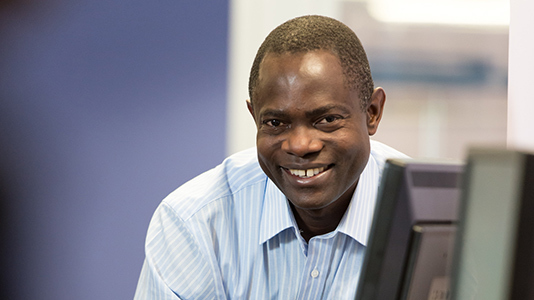 Jonathan Karusoke has been working as an adult nurse since completing his Diploma in Adult Nursing at LSBU in 2005. Like many in the nursing profession, he sees himself as a lifelong learner. He has twice returned to education and completed an undergraduate degree in Nursing Studies before rejoining LSBU to study our MSc Public Health & Health Promotion. The course was the ideal choice for Jonathan. As a former student, he knew what an outstanding reputation we have for nursing, while the vocational focus of the course appealed to him. Jonathan also shares our commitment to enabling people and communities to increase control over their health. He traces this back to his own childhood, which was spent in rural western Uganda. There he saw first-hand the suffering that preventable diseases can cause when coupled with the lack of a good education and social support. "Throughout my career, many of the patients I have cared for are from low income groups, ethnic minorities or single parents," he says. "They often have limited support and low educational attainment, and I want to play my part in promoting public health. Clinical medicine needs to be complemented with effective public health promotions to shift resources away from acute hospital admissions and towards preventative health promotion programs." All that remained for Jonathan was to find the funding for his studies. He applied for a Vice-Chancellor's Scholarship, knowing that if he was unsuccessful, he may not have been able to undertake the degree. Understandably, he is delighted with his success in securing £4,000 of funding via the scheme: "It's changed my life. My success has made me even more determined to succeed and has given me purpose, focus and determination," he says. "I feel that when I graduate, I will make positive changes to the lives of others through education raising awareness, and sharing knowledge and skills. I look forward to going back to work and promoting public health and health promotion in rural western Uganda, where I was born and grew up."